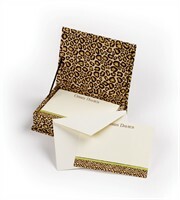 The Perfect Patterns Leopard Classic Box Set is a fun and elegant “must have” for your desk accessories collection! • Set Includes: 20 heavyweight cards with baronial envelopes • Cardstock Color: White • Envelope Color: • Font Style as shown • Size: Cards measure 6″ 1/4 x 4″ 5/8. The Perfect Patterns Leopard Classic Box Set is the perfect gift. These correspondence cards come already packaged in a handy decorated lidded box to keep your cards ready to use when you need them. The lidded box has a traditional leopard pattern while the sheets have stripes of a leopard pattern against a bright lime background. There is one line of text for you to personalize with your name or a phrase. Font comes in brown ink only, and font style appears as shown in sample. This product not eligible for international shipping.